Katriona’s polished and professional shows are in demand at highly prestigious events such as the Bentley convertible launch, which took place in a luxury venue in Marbella, Spain. Also a Bulgari sponsored event at the exclusive Olivia Valere night club, well known for attracting rich and famous celebrities in this part of the world – singers Prince and Mick Jagger, top models Naomi Campbell and Kate Moss and actors such as Bruce Willis, to name but a few. 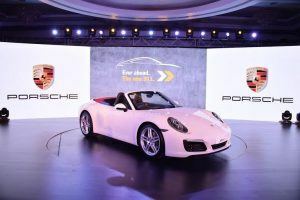 Other product launches include Porsche and Land Rover. Katriona performs for royalty and at many celebrity parties. Performances for celebrities include Elaine Paige, David Essex, Jeff Wayne, Naomi Campbell, Pete Murray, Andrew Castle and Rupert Grint, as well as sporting celebrities such as Maria Sharapova, Frank Lampard, Mark Webber, JPR Williams and Davis Cup star David Lloyd. Katriona has also performed for HRH Princess Alexandra. Contact Katriona for a quote or to discuss your event – she will be happy to customise a package to suit your requirements.